I'm slightly embarrassed to admit that I've made this recipe at least four times in the past couple weeks. And that's after I'd finished making all my recipe adjustments. For me, this is very unusual. I typically try to mix it up out of fear I'll get bored of a good recipe. Especially at dinner. For some reason, I can repeat breakfast / lunch over and over, but when it comes to dinner...well, I typically need more variety. But not with this recipe. I'm obsessed. At this time of year, grocers are literally giving away zucchini. For the past few weeks, my favorite vendor at the local farmers market has been selling it at a buck a piece. One dollar! Shut up and take my money. For anyone who visits the Lonsdale Quay market on Saturdays, this is my confession. Yes, I was that crazy person trying to stuff armfuls of zucchini into my undersized shopping bag. This recipe made me do it. This dish is perfect when you're craving a warm meal, without the heaviness that makes you want to take a nap afterwards (bowl of pasta, I'm looking at you). These zucchini fritters are nice and crispy on the outside, soft and flavorful on the inside, and topped with a creamy and refreshing yogurt sauce. And if that wasn't enough, both the fritters and sauce are packed with fresh, fragrant herbs. It's a perfect way to showcase the best of late summer. Fun fact - did you know, zucchini is technically a fruit? Yup, tomatoes aren't the only vegetables (I mean fruit) pulling the wool over our eyes! Zucchini is part of the squash family, which can be separated into summer and winter varieties. Zucchini is a summer squash, which means it gets picked while still "young" and has softer skin – which makes it good for eating either cooked or raw. Because zucchini is a good source of nutrients, you can feel great about piling your plate high with these yummy fritters. 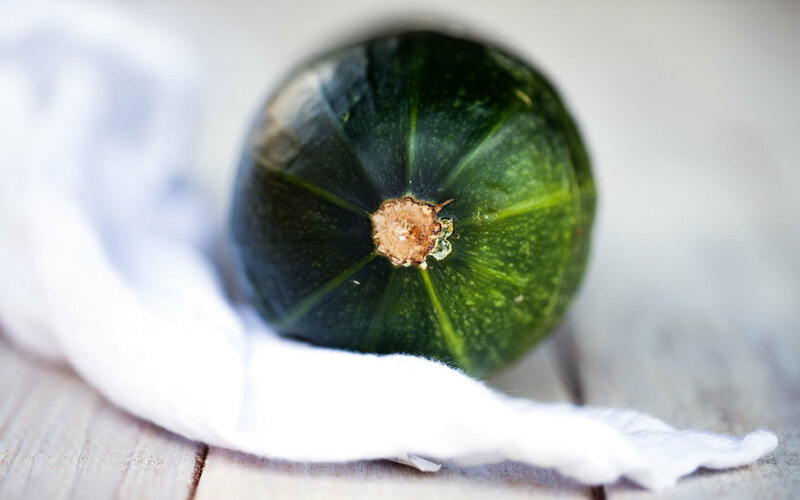 Surprisingly to some, zucchini contains fairly high levels of vitamin C. Usually when people hear vitamin C they think citrus fruits, but a cup of chopped zucchini provides about 30% of your daily needs - and this recipe will give you even more than that! In addition to providing about the same level of potassium as a banana, zucchini is also a great source of beta carotene. Beta carotene is converted to vitamin A in the body, which then goes on to perform many important roles. It's critical for eye health, growth and tissue healing, healthy skin and a whole host of other functions (including antioxidant effects). In order to benefit from beta carotene in zucchini, you'll need to consume the skin, so avoid peeling it. When eating the skin, try to buy organic zucchini when possible. Prepping this dish is fairly straightforward. It requires very little vegetable prep, which is probably why I found myself going back to it so often recently. A veggie heavy dish with very little chopping? Oh yes. Grating the zucchini, skin and all, is a great time saver. Since zucchini has crazy high water content (~95%), it's very important to remove as much liquid as possible, before adding the other ingredients. This recipe utilizes two steps to remove the excess moisture. The first step is salting the shredded zucchini and letting it strain in a colander. The salt will help draw out some of the moisture. You can be generous when "salting" the shredded zucchini because most of this salt will be removed before cooking. Once the zucchini has had a quick rest, you're ready to move to step two: squeezing out the zucchini. Using either a cheesecloth, nutmilk bag, or clean dishtowel, squeeze the shredded zucchini to remove as much liquid as possible. The dryer the zucchini, the better your fritters - so make sure you get it as much water out as possible! Unlike most fritter recipes, these aren't heavily fried in oil. I use only a small amount of coconut oil to prevent them from sticking to my cast iron pan. If you prefer to use a non-stick pan, go ahead. Otherwise, feel free to use a cast iron skillet or similar. But if you do go this route, make sure you're using a well-seasoned skillet, or be prepared to use a bit more oil to keep your fritters from sticking. In any case, much better than deep frying! The lemon-dill yogurt sauce is a perfect complement to these warm, cozy beauties. The yogurt provides a thick, creamy base, which is then spruced up with some lemon, dill, garlic, and capers for a bit more tang. It's a much tastier and healthy twist to a sour cream garnish that's often used on dishes like these. If you manage to have any sauce leftover (good luck), I highly recommend saving it for dipping with veggies or soft bread / pita. Wash and dry the zucchini. Slice off both ends. Using a box grater, grate the entire zucchini (including the skin). Place shredded zucchini in a colander over the sink. With the extra salt you have set aside for the prep, sprinkle a few generous pinches of salt over the zucchini. Toss the zucchini with your fingers to ensure the salt is evenly distributed. Let the zucchini sit for 10-15 minutes. While the zucchini strains, prepare the yogurt sauce. In a small bowl, combine greek yogurt, dill, lemon juice, capers and salt. Stir to combine. Cover bowl and place in the refrigerator. After the zucchini has rest, carefully pile half the shredded zucchini into your cheesecloth, nutmilk bag or clean dishtowel. Twist the top of the cloth so that the zucchini forms a tight ball, and squeeze out as much liquid as you can. Once dry, repeat with the second half. In a large bowl, place shredded zucchini, scallions, dill, garlic, and onion powder. Give it a quick stir to ensure the ingredients are evenly distributed. Gently mix in the two eggs; then add the flour, breadcrumbs, salt and pepper. Stir until combined. Heat a frying pan until it is very hot. You know it's ready when you drop a few drops of water on the pan and they sizzle away almost immediately. Drop in your coconut oil or butter, and ensure it covers the entire pan as it melts. Using a spoon, drop about small piles of batter (~3 tablespoons) into the pan. Use the back of a flipper to gently flatten the patties. More surface area means more crisp. Let the fritters cook for about 2-3 minutes on each side, until golden brown. Place the cooked fritters on a baking sheet lined with parchment paper, and place in the oven to keep warm. Repeat until you've used all the batter. Serve with a generous dollop of yogurt sauce, and slices of lemon on the side. -*If using gluten-free flour, I recommend an all-purpose flour substitute. Some gluten-free flours can be gritty, and that won't make for a good fritter! -**If using coconut oil for savory dishes, you may wish to opt for processed (deodorized) coconut oil. It doesn't impart the same coconut scent. -A trick for getting perfectly sized fritters is to use an ice cream scoop for divvying up the batter. The best are ones with a lever that "releases" what's inside. It works really well with this batter and makes the job even quicker.